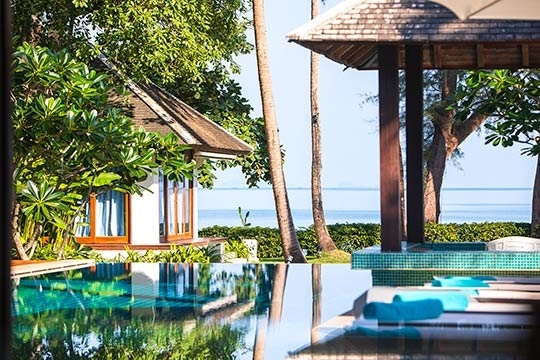 The sheer amount of space at Ban Suriya makes it feel like your own private resort. 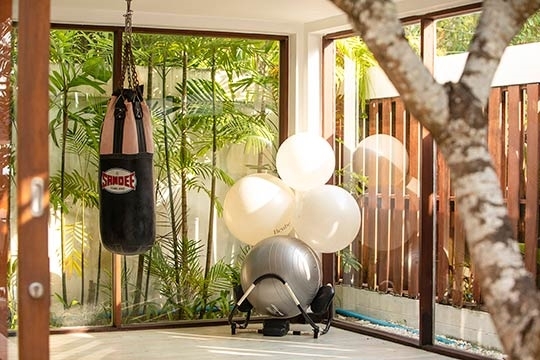 The 20m pool is great for either laps or a cooling dip, a fully-equipped gym features its own generous plunge pool and even a punch bag in case you bring any frustrations with you from the office. 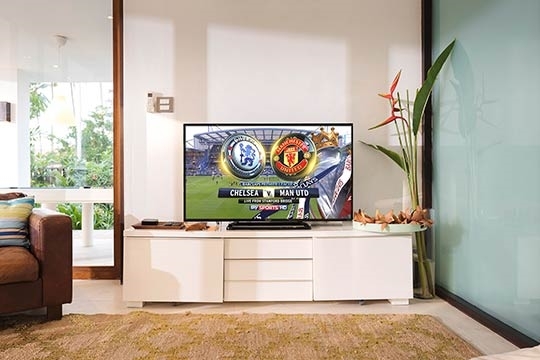 The comfortable games room boasts a shelf full of DVDs to watch on the 42-inch plasma screen TV, a Wii and Playstation, plus a good selection of books and board games. 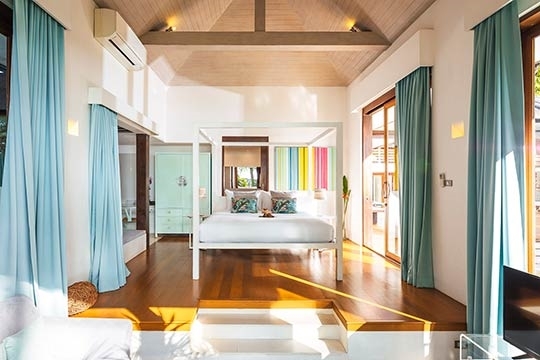 With an annex housing a twin bedroom and spacious bathroom, older kids or friends have the rare chance to enjoy the privacy of their own mini-villa. Even with all six bedrooms occupied you'll only bump into each other if you want to. 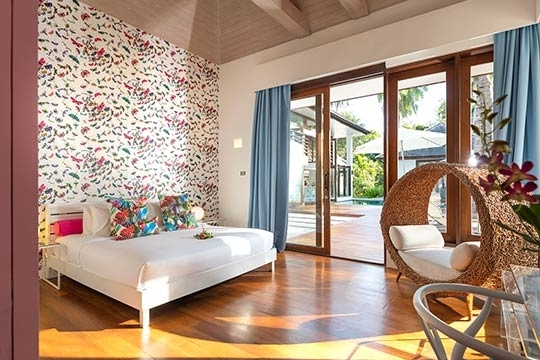 All the bedrooms have names (Shell, Peacock, Wave, etc. ), which reflect the personality that's gone into their design. 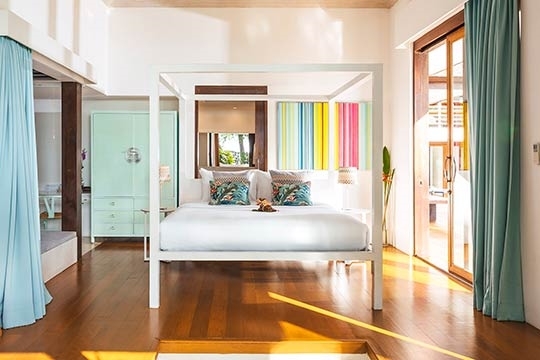 The freestanding tub in the master suite beckons romance, the poolside guest rooms slide open onto cool blue water, and the beachfront suite is a luxurious private retreat – inspired touches that add to the pleasure of the stay. 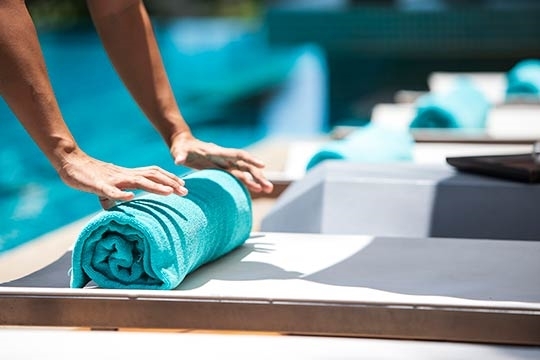 Three massage areas (one outside, plus a dedicated spa room attached to the main living pavilion and a massage bed in the master suite) mean soothing treatments can easily become part of your day (extra charge). 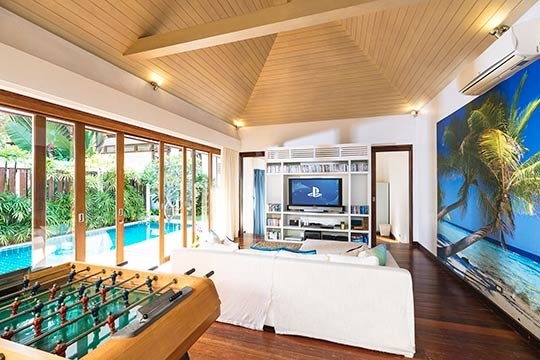 In the evenings, the unique addition of a pull-down projector screen transforms the lawn into an outdoor cinema, while those tired of celluloid can retreat to the peace of the sunken library or head up to the mezzanine lounge to sprawl or surf the net, or maybe even shoot some pool on the terrace. 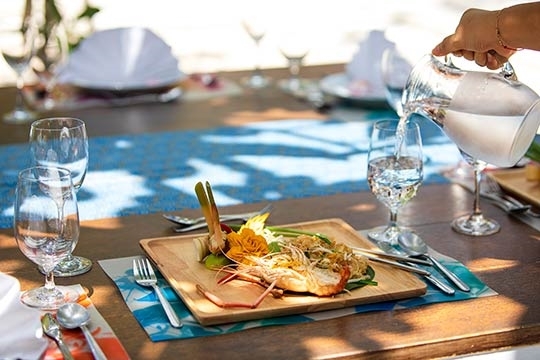 You can dine in the main villa, by the pool, in the tropical gardens or candlelit on the beach. 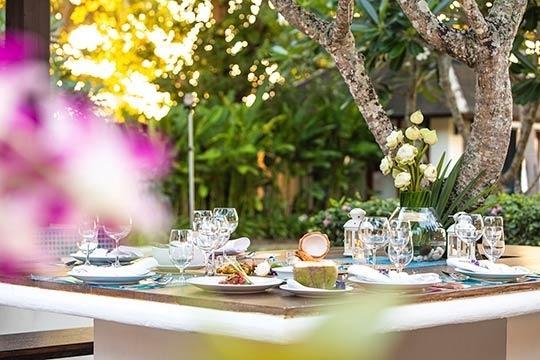 The villa manager leaves no request unmet, unobtrusive staff clean and prune, and a personal chef prepares tasty meals (on guest account) from a varied suggestion menu using freshly grown local herbs, fruit and vegetables from the villa’s own kitchen garden. 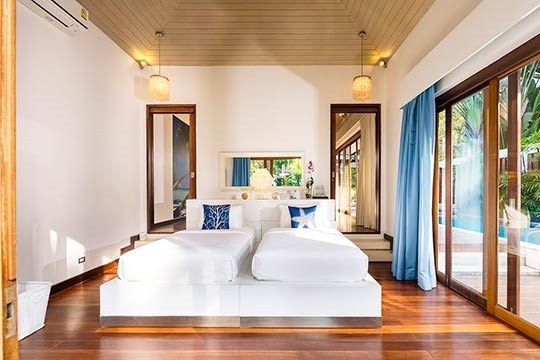 Ban Suriya is a model for luxury island living and certainly deserves its reputation as one of the island's top wedding villas. Almost every aspect of Ban Suriya is a highlight. 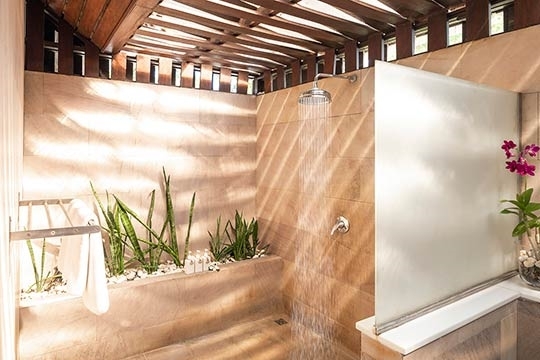 The bathrooms are certainly worth a special mention thanks to the semi-outdoor designs and indoor landscaping, as are the multifarious, attractively furnished lounge areas (four in all, if you count the one in master suite). 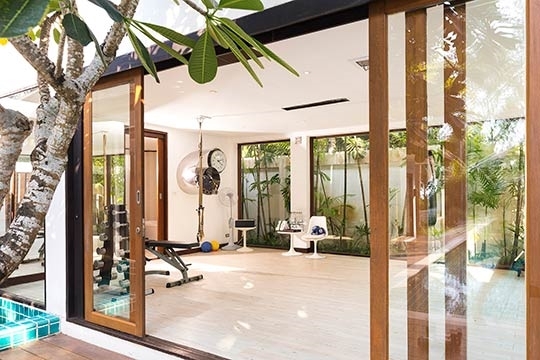 The gym annex is a ‘villa within a villa’ and a great option for older kids or singles. 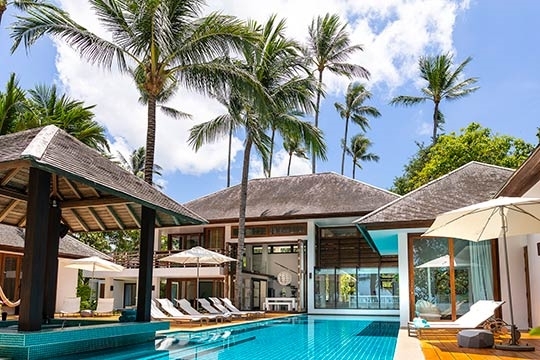 Outside, the poolside sala is an appealing place for drinks and dinner and the tree house is a stroke of genius that will delight kids and adults alike. We found only pleasant surprises, really. Occasional traffic noise from the road behind the villa may worry sensitive souls, but it's only noticeable because the location is so serene. 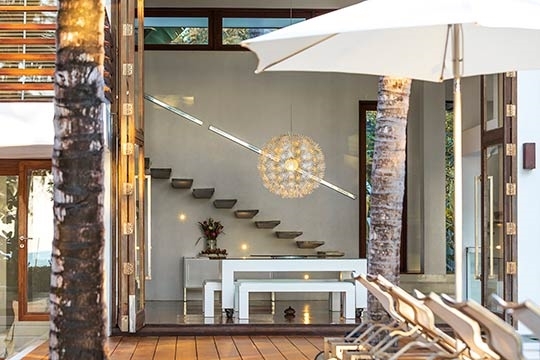 Although Ban Suriya is definitely family-friendly, the ‘floating’ stairs leading to the mezzanine lounge, the sliding doors opening directly to the pool, and the ungated beach access mean it would be wise to keep small children closely supervised. Ban Suriya is indeed great! We all had fun as guests and we were never bored. The staff on board were all very accommodating. Truely impressed! 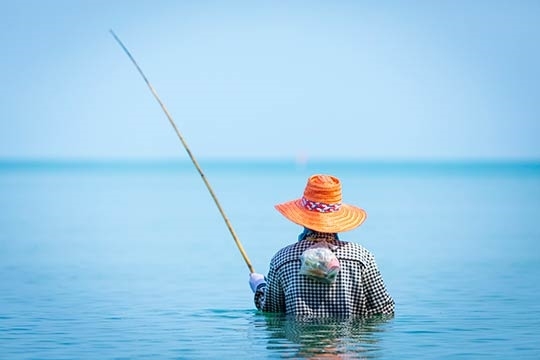 Ban Suriya is at the centre of Lipa Noi's slightly busier, north-facing beach, but it is still a peaceful spot, home to a few local fishing families that moor their boats close to the shore and gather their nets for repairs in the shade of the coconut palms. 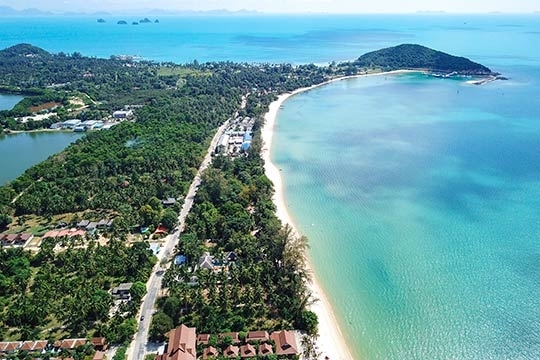 On clear days you can enjoy fabulous views out to the Angthong Marine Park, while a short walk north brings you to some low key beach resorts and restaurants. 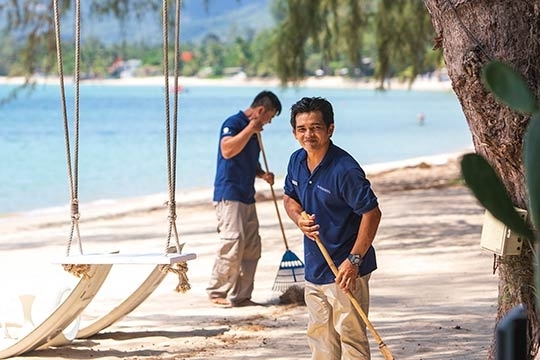 The Nikki Beach Resort is also on this stretch of beach, but far enough away to remain unobtrusive. There's a ferry pier to the mainland around two kilometres away, but this has little impact other than occasional through traffic on the road behind the villa. 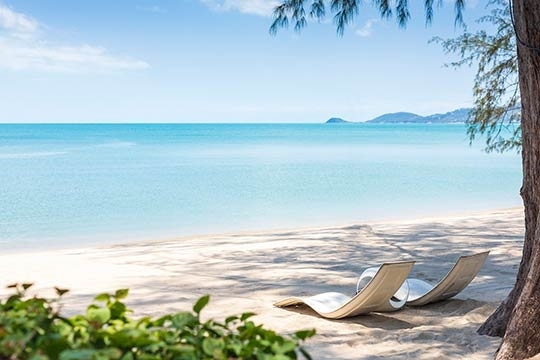 One of Koh Samui’s best-kept secrets, Lipa Noi boasts three kilometres of curved white sandy beach smack in the middle of Koh Samui's west coast. 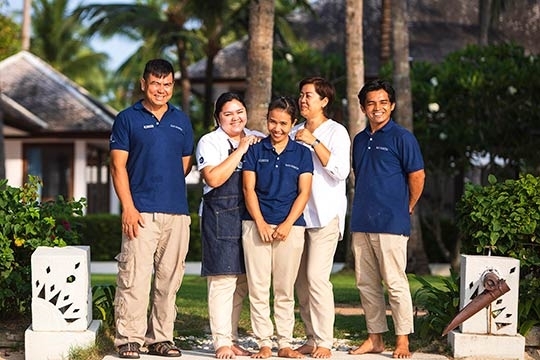 With its local village ambiance and laid-back beachside vibe, Lipa Noi makes an ideal destination for family holidays or a special getaway with friends. 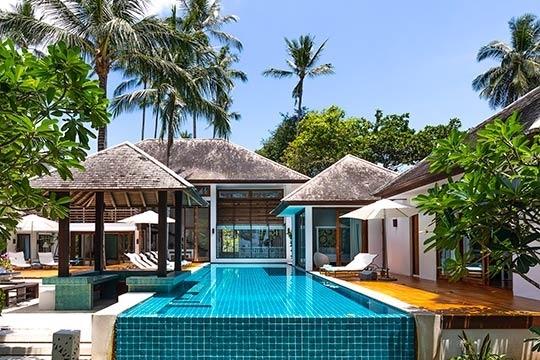 If stunning sunsets, calm crystal waters, fine sands, swaying coconut palms and a selection of exceptional private luxury villas tick your boxes, then take a closer look at Lipa Noi. 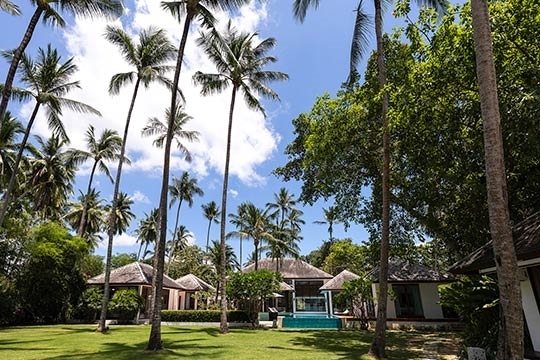 The picturesque sandy beach here is one of the best on the island for kids, and there’s plenty of shade from the coconut palms lining its edge. 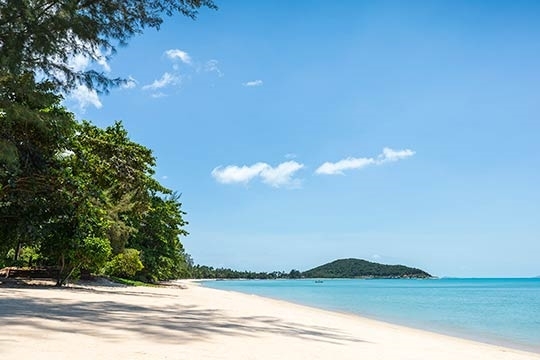 Calm and very shallow water means year-round safe swimming and a good choice of watersports, and although Lipa Noi is only five minutes from the mainland ferry pier, it is the most serene and untouched beach on Koh Samui’s west coast. 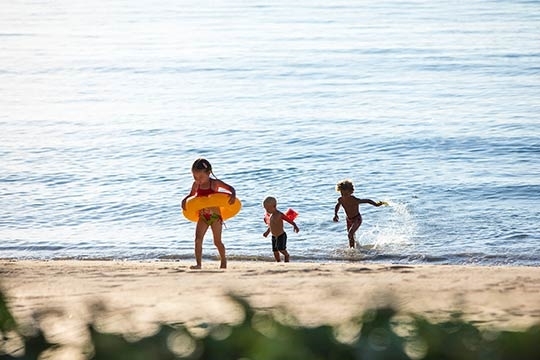 For a carefree family holiday, Lipa Noi is hard to beat. 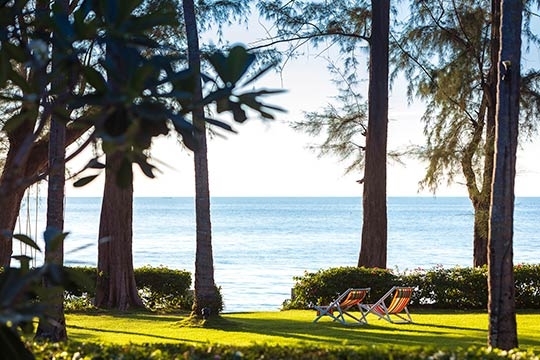 You’ll find plenty of places to eat, both on and off the beach and a massage under the shade of a palm tree, with views across the island-speckled waters of the Gulf of Siam, is easy to fix. 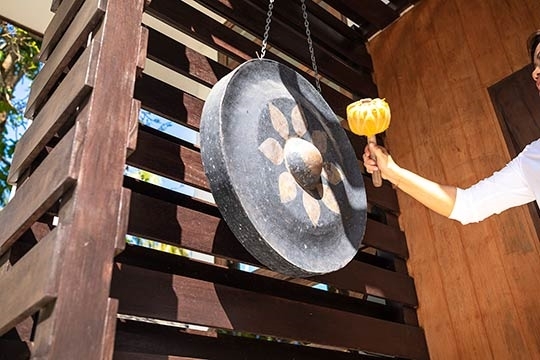 Lipa Noi is also close to a number of popular Koh Samui attractions, including the island’s main waterfalls at Namuang, the Magic Buddha Garden high in the hills, and Paradise Park Farm, a family friendly adventure with a hilltop pool, animal and bird feeding and amazing views. 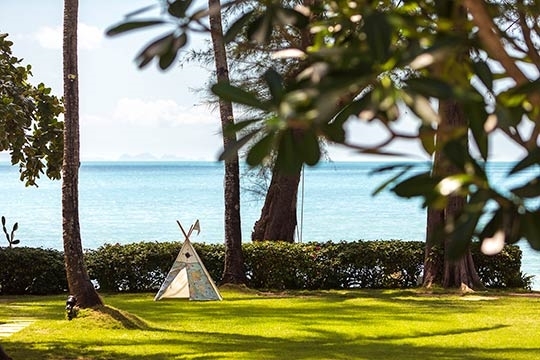 Although Lipa Noi and the west coast of Koh Samui is better known for its peace, quiet and exclusivity, it’s also home to one of Samui's trendiest beach clubs, the Nikki Beach Resort, which draws visitors from across the globe. 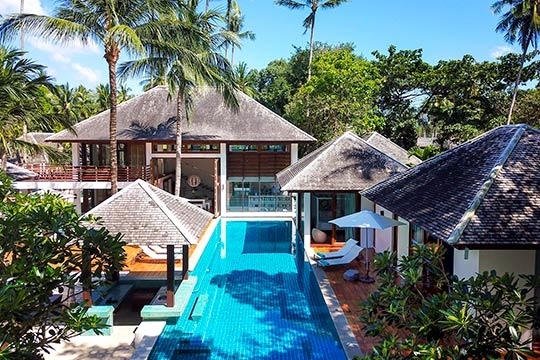 With some of Koh Samui’s most sought-after accommodation located close to the beach and in the lush forested hills above the ocean, a Lipa Noi luxury private villa holiday is guaranteed to deliver total rest and relaxation. From a landscaped driveway, steps climb to the grand wooden doors. 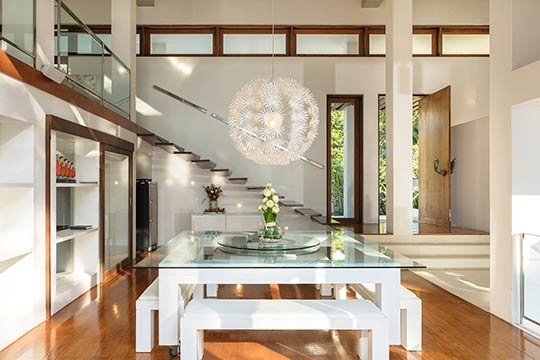 These open onto a spacious, split-level, two-storey living pavilion. 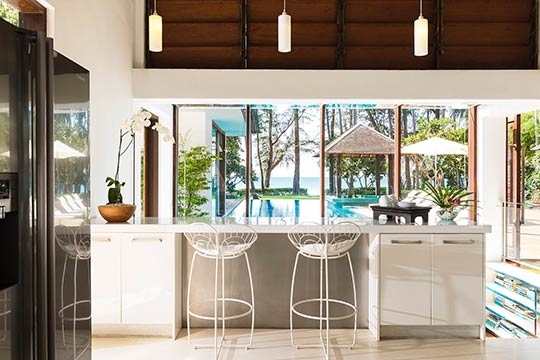 The ground floor houses a fully equipped kitchen with 8-seater breakfast island, the dining room features a sleek, glass-topped table with a ‘Lazy Susan’ and four white benches (seats 12). 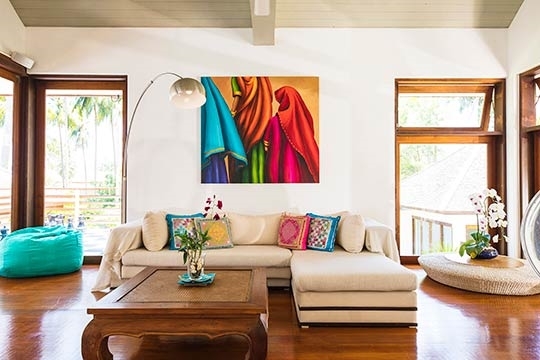 The cosy library nestles at the bottom of a few steps with two white sofas facing a glass wall looking into the swimming pool. From the dining area, more steps lead down to the spacious living room with cream sofa, comfortable leather armchair, flat-screen TV and DVD player. 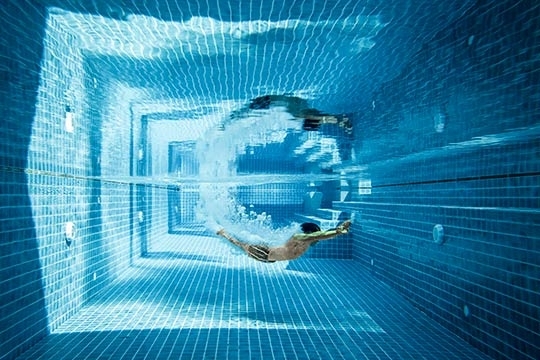 Sliding doors open onto a sunken terrace with massage platform. 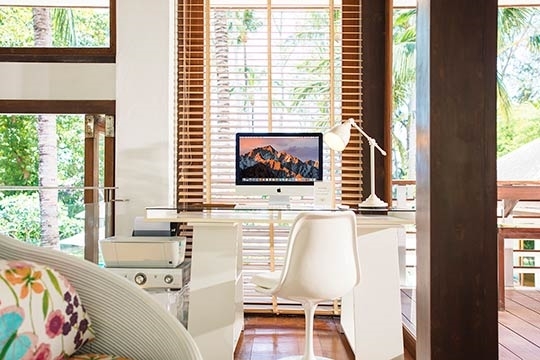 Back inside, a ‘floating’ wooden staircase takes you up to a mezzanine area with stylish and quirky seating, which doubles as a lounge or office, complete with iMac computer. 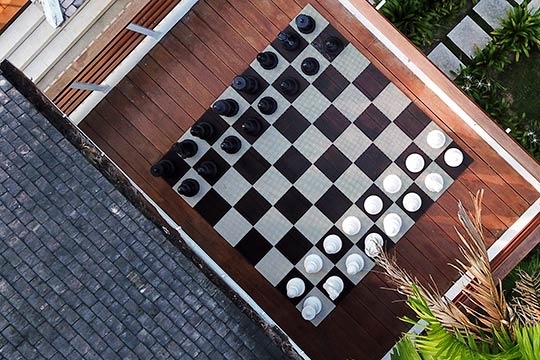 Glass doors open onto a wooden deck overlooking the garden and ocean, with a ‘life size’ chess set, a pool table and a fridge stocked with cold drinks. 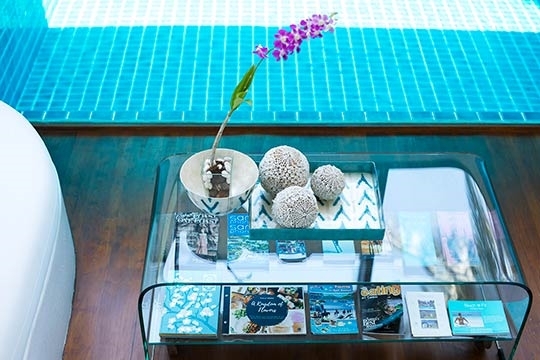 Four of the bedrooms are located around the generous infinity pool and sun deck, which is serviced by a pool bar. 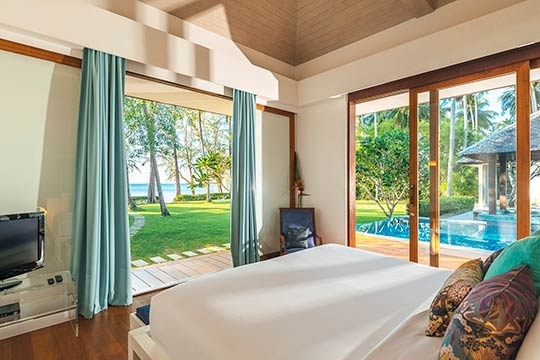 The master boasts a lounge, as well as a dressing area with a dedicated massage bed and stand-alone bathtub set over white pebbles. 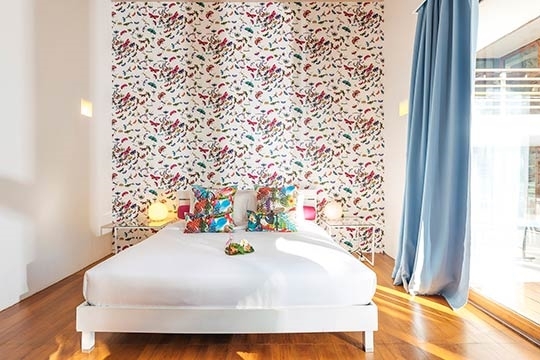 All four poolside bedrooms have king-size beds, HD TVs, DVD players and blutooth sound systems, with sliding doors opening onto terraces (one room opening directly onto the pool). 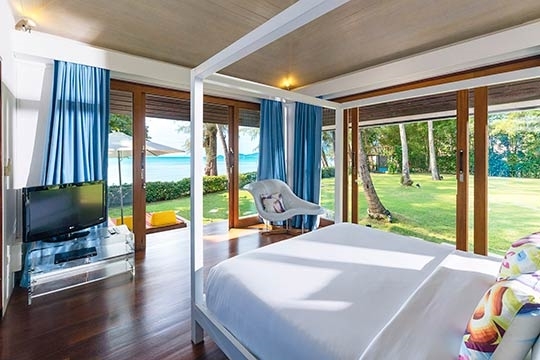 A fifth king-bedded room is situated in a separate pavilion right by the beach. 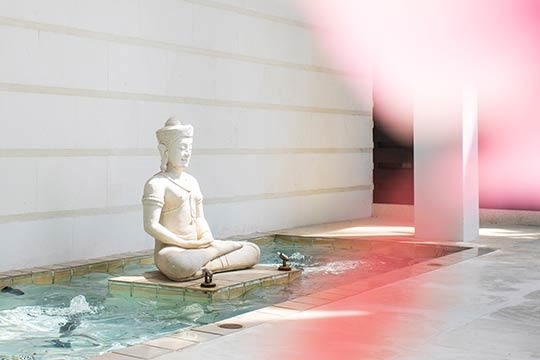 This bright space boasts a covered outdoor bathroom and glass doors opening onto the lawn. A projector screen can be pulled down outside this pavilion and beanbag seating arranged on the grass for moonlit movies. 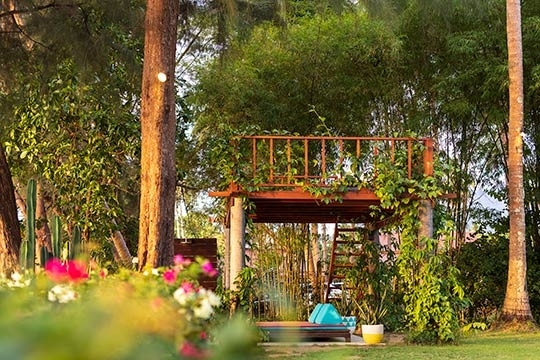 The lawn continues down to the beach, where an attractive tree house overlooks the sea accessed by a rope ladder and furnished with cushions. 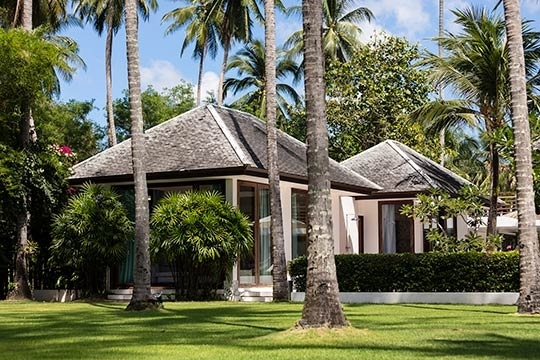 Tropical pines mark the border between the lawn and beach, where an indulgent hammock promises long siestas. 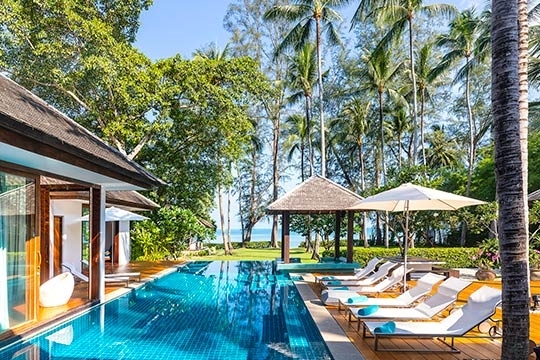 If you’re feeling more energetic, there are two kayaks and a stand-up paddleboard available for guests to use. 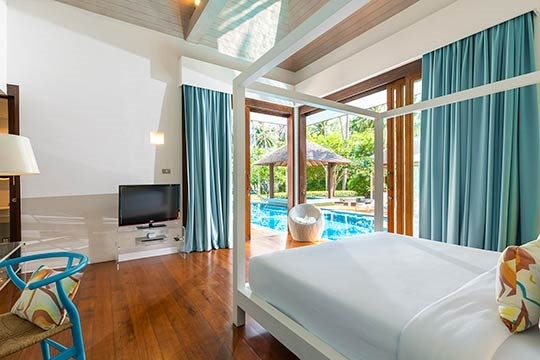 The twin-bedded room (with two additional slide-out beds making a total of five extra kids beds at the villa) is located in an annex to the rear of the main living pavilion. 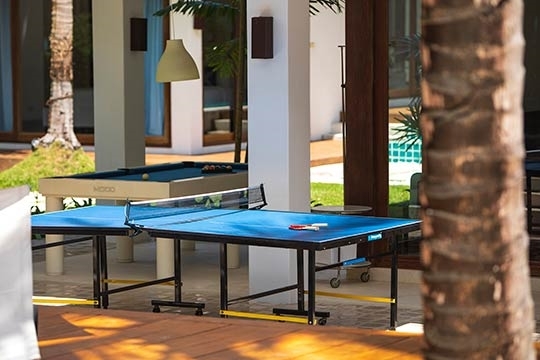 The annex also features a fully equipped gym and comfortable games room with flat-screen TV, DVD player, electronic games and fusball table. The bathroom is shared with gym users. 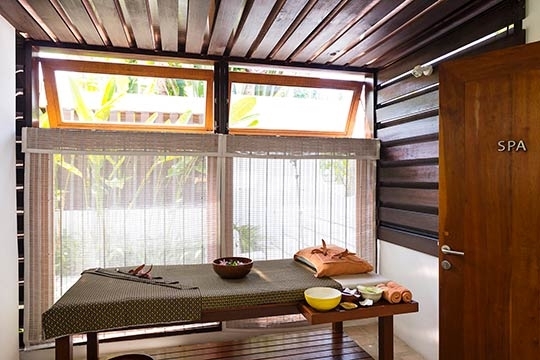 An 8m plunge pool is encircled by a wooden sun deck, making this annex a totally independent living space. 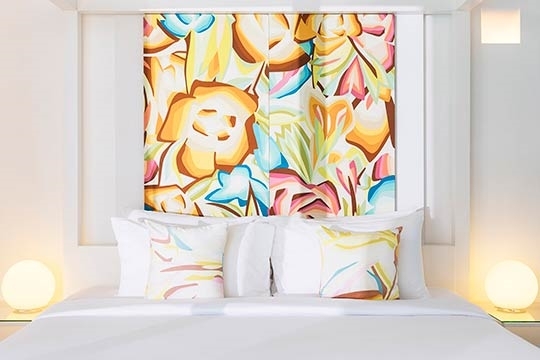 Discounts are sometimes available for booking early (usually 120 days and over prior to check-in). For discounted rates click on the Check Availability button and enter your dates or contact Customer Service. 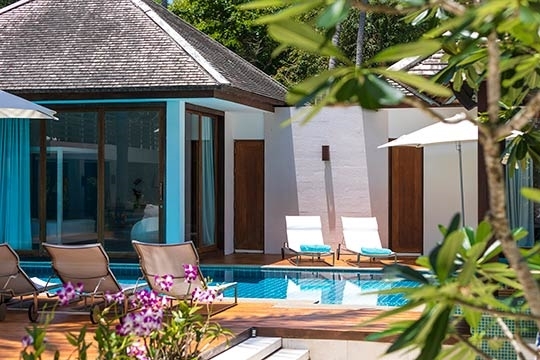 Lower rates are available when booking this villa as a 5-bedroom for 10 adults and 6 kids under 12 years (offer not valid for prime and Christmas/New Year periods). Contact Customer Service for details. 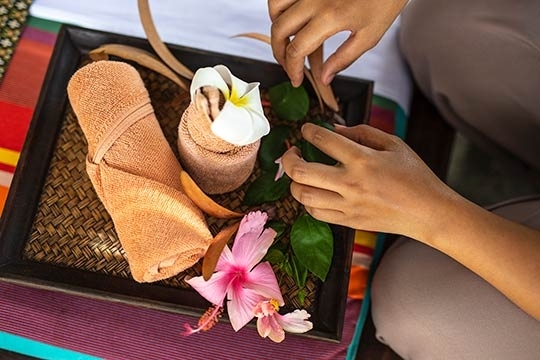 Changes to a confirmed booking such as amendment of dates will be treated as a cancellation of the original booking and cancellation charges may apply. 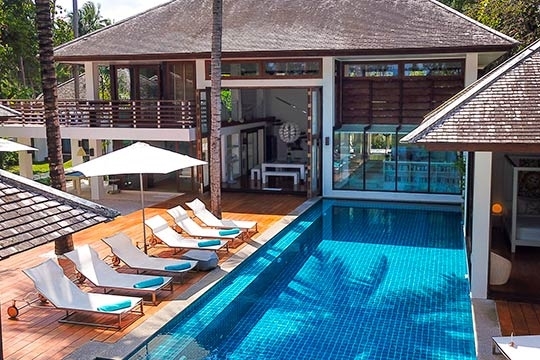 6 bedroom villa located in Lipa Noi, Koh Samui. 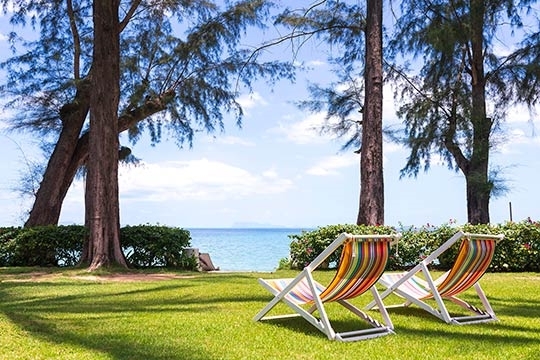 Ideal for Beachfront, Body and soul, Bring the relatives, Executive escape, Kid friendly, Gastronomic delights, Fair share for groups, The great outdoors, Party pads, Sensible for seniors, Room with a view, Perfect for weddings. 9 out of 10 based on 22 user reviews.